The 43rd edition of the Toronto International Festival kicked off today, September 6, 2018 with Kenyan flick, Rafiki screening as part of the opening night line up. Directed by Waniru Kahiu, Rafiki is a love story between two young women who find each other in a society that grapples with homosexual intolerance. Rafiki, which has been banned from screening in Kenya, was first viewed internationally at the Cannes Film Festival in May 2018. Speaking at the Toronto International Film Festival, Waniru Kahiu stated that only the lead actors in the movie have had a chance to see the film, due to the restrictions in Kenya. Rafiki is an adaptation of a short story by Ugandan author Monica Arac de Nyeko. Notable is the fact that in July 2018, Ugandan women protested violence against women and other human rights injustices in the country. Against this backdrop, it is quite remarkable that this story by a Ugandan has been made into a movie by a Kenyan woman. The importance of the story told in Rafiki is further buttressed because of the need to ensure that there are safe spaces for creatives in the LGBTQ community to express their creativity. With the extensive homophobia in Kenya and other African countries, Rafiki highlights the fact that gay people are beaten and sometimes killed, as a result of the intolerance. The filmmaker spoke about the challenges her team had sourcing funding for the film – including but not limited to having to find the right partners who were willing to be a part of the journey. Furthermore, there was the challenge of having to navigate members of the crew who were homophobic. She stated that at some point during the filming, they did not tell every member of the crew the full story behind the film. Waniru also noted that the two lead actors, Samantha Mugatsia and Sheila Munyiva had no previous acting experience. Kanihu had discovered both women and they worked with an acting coach. This is impressive, especially because the performance held the audience spellbound. Speaking on the use of music and fashion in the telling of the story, Waniru Kanihu stated that the choice of songs were made to accentuate the tension in the story as the romance intensified between Makena and Ziki. At the first screening at TIFF, Waniru Kanihu looked elegant in a mustard colored dress by Nigerian fashion designer, Ilare. 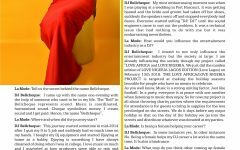 Exclusive with DJ BellCheque for La Mode Magazine May Edition Cover !